WE’RE BACK. 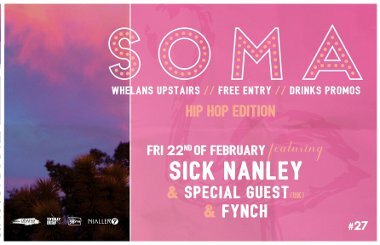 Dry January is over and we’re coming back with SOMA #027 THE HIP-HOP EDITION. We got two of Burner Records finest with Sick Nanley and FYNCH, then our very first act from The UK who’s been getting the not by tastemakers NME, Clash Magazine, The Line Of Best Fit and many others.. we’ll reveal our special guest on the day of the show! As per usual we’ll have the SOMA Resident DJs spinning your favorite indie (&hip-hop) tunes until 3am! SOMA originated as a series of house parties in Dublin hosting bands and DJs until stupid o’clock. The SOMA clubnight aims to carry on the house party tradition, showcasing Dublins best up and coming bands followed by a sweaty party soundtracked by all your favourite indie and alternative bangers. FIDLAR, The Dandy Warhols, Arctic Monkeys, Parquet Courts, The Virgins, QOTSA, Blur, Bloc Party, The Strokes, Sleater-Kinney, Brian Jonestown Massacare, The Hives, Wavves,The Vines, Bikini Kill, The White Stripes, The Kills, Nirvana, Yeah Yeah Yeahs, Foals, Interpol, Death From Above 1979, The Libertines, Smashing Pumpkins, Green Day, The Stone Roses, Justice, The Orwells, Tame Impala, The Last Shadow Puppets, Kings of Leon, Phoenix, Editors, Glass Animals, The Vaccines, Warpaint, Circa Waves, Wild Beasts, etc. etc.